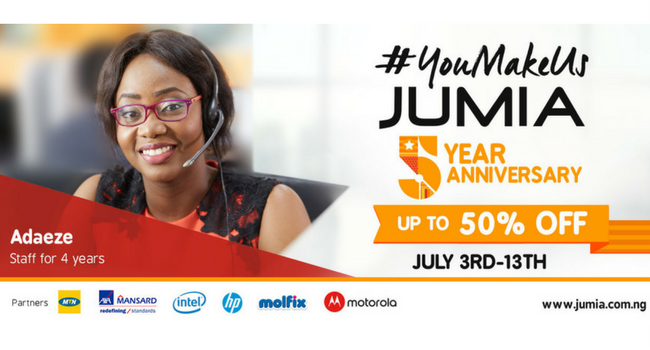 In 2017, I had the honour of being not just the Producer of the Jumia Nigeria 5th Anniversary TVC but I also commissioned the photography for the campaign OOH. This was my first time being the Producer of a brand TVC (I mean, at Spice TV I was Associate Producer and I 'think' the experience kinda had a part to play in this project) so I was a bit apprehensive but determined to make it a success. I had an amazing team of creatives who were awesome. I had a Copywriter who wrote the script, an Art Director who worked on the storyboard for the TVC & was the photographer on the campaign, then there was - y'all know him @thesmilinghat. Taiwo of Badex Interactive Solutions was the Director and he is such an easy person to work with. Helps that he knows what he is doing too. That's literally us - a team of 5 and we delivered this masterpiece and in good time too. I got a referral from the Client as she was super impressed with the service delivery I & my team offered on the Jumia TVC project. Here's what she had to say in the referral email. She has deep agency experience and industry relationships and brought a team together to conceptualise and produce Jumia's 5th anniversary TV Commercial. I found them to be efficient, professional and speedy with their processes.